I Invited Them To Lunch, They Stayed Three Days. Though our connection began long before we’d ever met, I first saw Ralf and Liên at the 55 Bar in the Spring of 2008. Everybody in my band seemed to know them. There was quite a commotion when our first set ended. I had noticed the two of them, they looked so happy and so into the music, Liên with her long black hair and her exquisiteness. I felt compelled, I had to know them so I asked outright, is anyone going to introduce me to these people?! Lovers of live music that they are, Ralf and Lien were ardent followers of the extraordinary bassist Richard Bona. Richard and my longtime bassist Mamadou Ba are very close friends and have been for years. Ralf and Liên had seen Aaron Heick playing sax many times with Bona and so they knew Etienne Stadwijk (on keys) too because he’s played with Richard touring forever. They also met Ray Levier (on drums) at a gig in New York. Ralf had written to Aaron, Ray and Etienne asking what music they should see in town. Everyone pointed to the show at the 55 Bar. But what they didn’t realize was that all three of them were playing with me that very same night! So it was a very joyful surprise to everyone. Jean Marc owner of the Baz Bar in St. Barthelemy French West Indies, where I have played for the past eleven years happened to be in the club that night. Laura from Italy was there too so we all ended up having breakfast in the middle of the early morning telling life stories and talking politics and music in waves and laughing. In the fall I received an email from Ralf, saying that he and Liên would be coming to New York for a week and he was bringing me Glucosamine for my knees. For a moment I couldn’t remember Ralf, or complaining about my knees but when I did remember the breakfast at Manatu’s diner, I wrote back and invited them to lunch on a Friday – they stayed for the next three days, laughing, eating, telling stories of their five children and sitting on our back porch. Over time we have cultivated a ritual where we see each other very often. Well, to be honest, this is because Ralf and Lien have traveled to New York City on a regular base for a vacation. This is only one of the things that makes being around them so special, their commitment to enjoying life in the here and now. Their visits have coincided with many birthdays, both Lisa’s and mine, and during the volcano, when all air travel was cancelled, we spent nine days living at our house. I think that is when we became like a family, even better than a family. If nothing else, I would like to believe that this friendship and all of it’s tangential connection to my music, my friends, my band and my life was destined to be. I have been inspired and changed as a result – Ralf and Liên have an eye and taste for beauty. I am so happy that they have worked so hard to share this with the world through BdN. It is my honor to be connected and to watch this unfolding – we all work too hard and it is always in pursuit of beauty on some level, better yet, on every level. KJ’s performances will move you to laugh, to dance and even to cry. 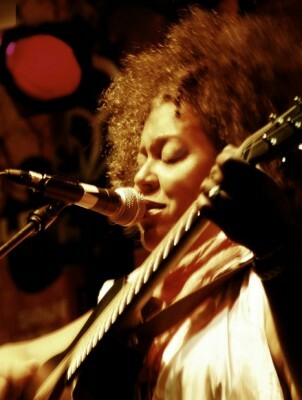 Her special blend of urban folk & jazz has earned her four Independent Music Award nominations and in ’09, she was named as one of Jazz.com’s top female vocalists. She’s appeared at scores of festivals and has residencies at the ’55 Bar’ and at ‘Smoke’ in NYC, at the ‘Baz Bar’ in St. Barth’s, and the prestigious ‘Umbria Jazz Festival in Italy’. Her last, “Album No. 9”, a collection of 60’s jazz, pop, and rock standards is in the news with a 2012 Grand Prize in the John Lennon Song Writing Contest. The very latest EP, Destiny, is set for release on KJ’s MCR label in 2012. ‘Consistently praised for her pathos, originality and impeccable musicianship, KJ is a one of a kind songwriter, guitarist and performer, not to be missed’. PS :Breaking News : KJ Denhert won the ‘John Lennon Award 2012’ in the category ‘World Music’ with ‘Choose Your Weapon’ !